Afghan Girls Robotics Team Allowed To Enter U.S. For Competition : The Two-Way President Trump intervened to find a way to permit the girls entry after their applications for visas were twice rejected. For the budding scientists, the path to compete has been a long one. 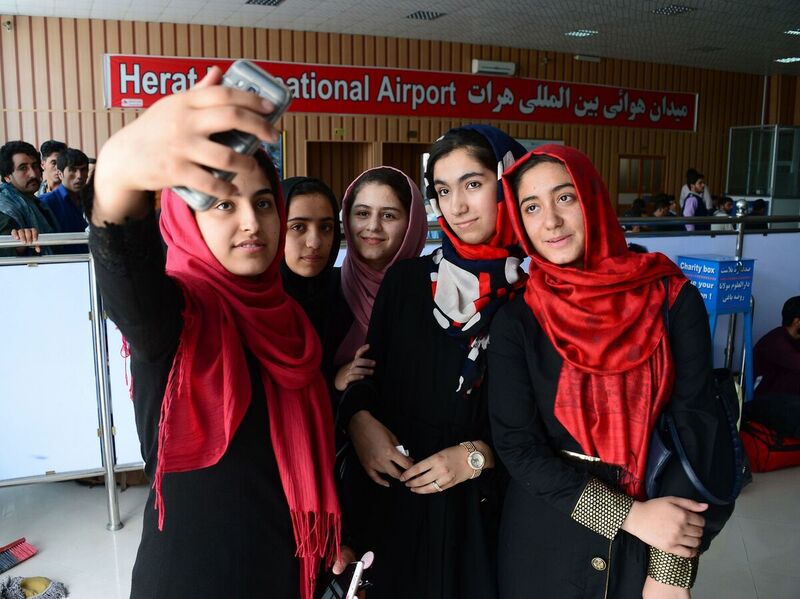 After twice being denied visas, a team of Afghan girls, who stopped for a photo at Herat International Airport in western Afghanistan on Thursday, has been permitted to travel to the U.S. for a robotics competition. It has been an odyssey, but finally, a team of six Afghan girls will be able to travel to the United States to compete in a robotics tournament. Two previous attempts to secure visas, which involved traveling 500 miles to the U.S. Embassy in Kabul, had failed. The U.S. State Department had told the Associated Press that it would not comment on why the girls' visas had been denied but that "all visa applications are adjudicated on a case-by-case basis in accordance with U.S. law." Afghanistan isn't one of the six countries targeted by President Trump's travel ban. Trump intervened to find a way to permit the girls entry, the AP reports. The National Security Council opted to "parole" the girls — a status, the U.S. Immigration and Citizenship Services explains, requires "an urgent humanitarian reason or significant public benefit." The girls will be granted one-time entry to the country. 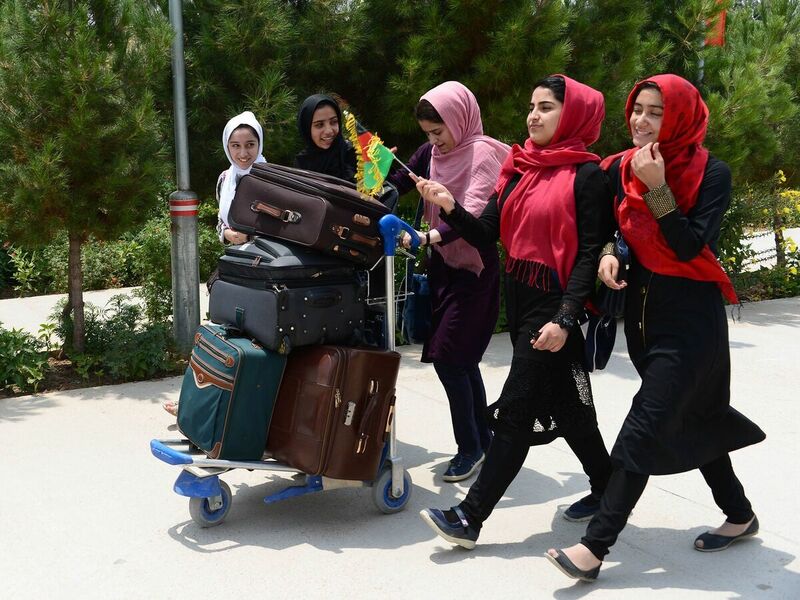 "We were disappointed, and we were feeling bad, but now we are very happy that they have given us a chance to go," 14-year-old Fatemah Qaderyan told Reuters as the girls arrived in Kabul on Friday, bags packed for their trip to Washington, D.C. The robotics team's journey has involved trips of hundreds of miles and, eventually, President Trump's assistance. The journey has been a long one. The girls spent six months building their robot, the AP reports, often working six days a week — and then they had to persuade their parents to let them go, in a country that often discourages girls in science and math. Then to apply for visas, they traveled twice to Kabul — site of a bombing on May 31 that killed 150 people — and their applications were rejected. The team's robot can sort balls, recognize blue and orange, and move objects to their proper places, according to the AP. If the girls had not been able to attend, they would have watched their robot, which was cleared for entry to the United States, compete over Skype.
" 'It is sad to say, but some of them do not come back,' said Elham Shaheen, a senior official at the Ministry of Higher Education who manages foreign-study policies. He said 10 percent of Afghans who are awarded temporary visas for academic purposes in the United States or Europe defy immigration rules to remain there permanently. "Female students and faculty members, facing extra frustrations at home, are no exception. Several years ago, Shaheen said, 12 female university lecturers won scholarships to obtain master's degrees in economics in Germany. Of the 12, he said, '11 of them escaped.' "
The girls go to three different high schools in Afghanistan and will be traveling with their team manager, Alireza Mehraban. "It's a happy moment for our team," Mehraban told the AP. "We are going from a war-torn country and the purpose is to show the capability of Afghan women. It's an important step for Afghan women." The international competition, which runs July 16 to 18, is staged annually by the nonprofit First Global. One team from each country is invited to participate, like an Olympics of high school robot builders. Gambia's team, which designed a robot to clean contaminated rivers, also faced visa problems but was permitted last week to travel to the U.S.
"I truly believe our greatest power is the power to convene nations, to bring people together in the pursuit of a common goal and prove that our similarities greatly outweigh our differences," said First Global President Joe Sestak in a statement. "That is why I am most grateful to the U.S. Government and its State Department for ensuring Afghanistan, as well as Gambia, would be able to join us for this international competition this year." With the final obstacles to their journey removed, the girls can now turn their focus back to robotics. "Afghanistan is a war-torn country where it is difficult for women to improve," 15-year-old Lida Azizi told Reuters. "But now this is a big chance for us to attend in the competitions and also it's good for our country."